Ever listened to Holst’s The Planets? The celebrated music dramatically captures planetary belligerence. “How can planets affect us and how would visiting temples enshrining planetary deities mitigate their machinations against our ambitions?” sceptics sneer. Planetary impact on our lives is palpable, surely. 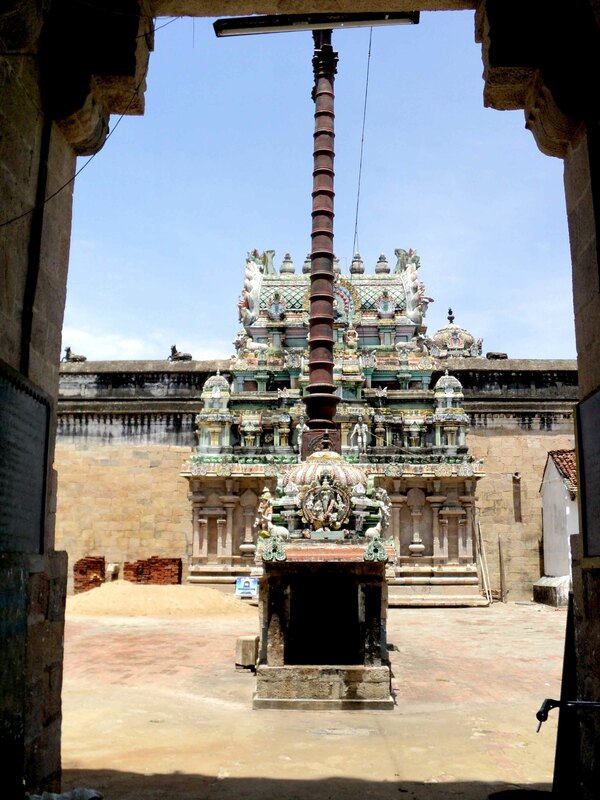 Yet the benefits of circumnavigating the navagraha temples swirled around Kumbakonam mystified me. I have long derided internationally-dispersed South Indians who descend annually to appease nine planetary deities. Now, I find myself fortuitously inclined to investigate the practice. Or is it fortuitously? When I first arrived in Chennai from Paris, seven years ago, I was directed to award-winning tour operator Parveen Holidays meant to best showcase Tamil Nadu. I met Afzal, the owner, who recommended the navagraha circuit. “I am NOT on pilgrimage!” I recall establishing vehemently; temples of historic and/or architectural grandeur alone were of interest to me. Last month, I chanced upon Krishna. He expatiated on temples. He asked me over to Parveen Holidays, of which he had recently become Asst. General Manager. Krishna has researched temples for 15 years. I decided to listen with more humility than accorded seven years ago. Only, he suggests the Great Chola Temples, Meenakshi and Chidambaram and I regard him disdainfully. Seen those. Now, the navagraha temples entice me. The irony of my reversed stance staggers. Krishna declares our present meeting no fluke, my new fascination for the navagraha temples not aleatory. He reveals there’s a navagraha cluster outside Chennai but these do not have the same “vibrations” as their Kumbakonam counterparts. My ears prick. These temples, whose disposition replicates the celestial placement of grahas conceived by Siddha Idaikattar, trap cosmic radiation from the corresponding planet. The resultant electromagnetic fields generated regulates mental vibrations and tames the mind, transforming one’s mindset. A calmer mind engenders clarity of thought, opens the Third Eye, eventuates universal perspective, culminates in nirvana (enlightenment) and moksha (liberation from the cycle of birth and death). Considering Einstein’s Mass–Energy equation and the wave–particle duality postulated by quantum mechanics, it is conceivable how cosmic radiation collides with mental waves/vibrations in an excruciatingly complex dance whose choreography natal charts determine. Imagine the mind as a discordance of jarred mental strings strummed by planetary electromagnetic forces. The reigning planet of the moment turns conductor, making life symphonious or cacophonous. Saturn-afflicted? Ostensibly, visiting the Saturn temple modulates out-of-phase thought waves, attuning them to resonant frequency. “How illogical!” my Philosophy tutors at Oxford would scoff, as they did in my undergraduate days. Western philosophy cannot explain how matter (which behaves dually as particles and electromagnetic waves) affects the mind, which philosophers including Plato classify as “spirit”. Vedanta circumvents the dilemma by extracting mind out of spirit realms and embedding it in prakriti (loosely translated as ‘nature’). In the Bhagavad Gita, mind and intellect are cleverly relegated to the lower prakriti of Brahman (the “Indefinable” variously grasped as “Universal Conscience”, “Intelligent Principle”, “Immanence” or “Supreme Potency”). This resolves the impossibility of matter (planets and their radiation) impacting a qualitatively different substance mind. 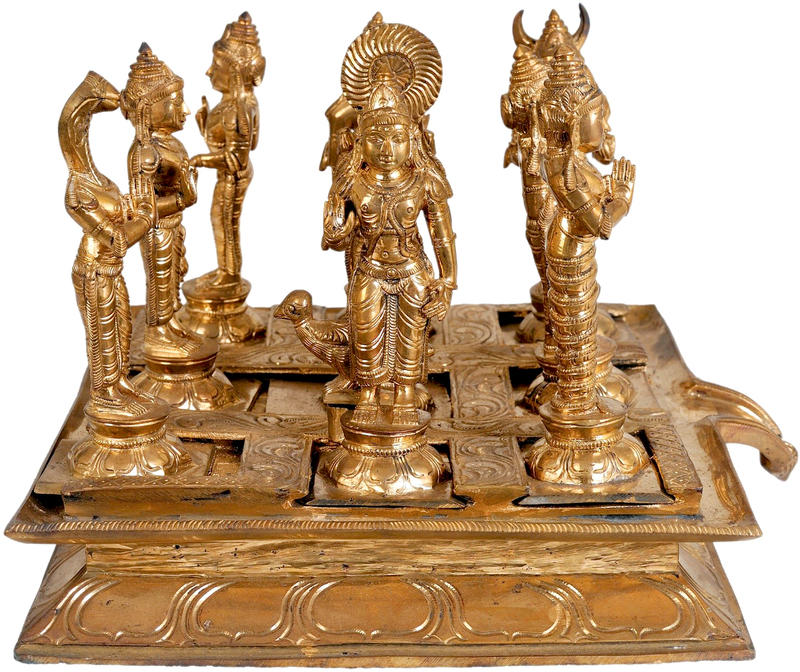 Mind and matter both partake of prakriti and can play together. Unaffected is the actionless Brahman. Paradoxically, you go to temples with correct vibrations to correct mental vibrations to attain Brahman that has no vibrations. I am veering into technical hairpins. Krishna had counselled that one must go to temples as a pilgrim and not as a philosopher or tourist. I was defiant that I must ascertain the empirical effects. Admittedly, in June, whilst in Swamimalai for nadi josiyam I curiously and cursorily wandered into the navagraha temples as an experiment. Having visited eight of them, I discerned a distinct becalming effect. Others perceived it too and queried if I had seen a shrink. In September, I sense obstreperous elements in my mind resurge. To counter this recidivism I am impelled onto navagraha Part II, especially as in June just as I reached the Ketu temple, the priest locked up. This denial and its import rankles. I seek Sakthivinoth, owner of the Sri Agasthia Maha Siva Nadi Astrological Centre, who I met in June. I must see his nadi reader Sivamurugan and translator Vinod. They are busy dispensing nadi predictions to 80 Italians. I must know, URGENTLY, why I did not enter the Ketu temple in June. Does this signify catastrophe? 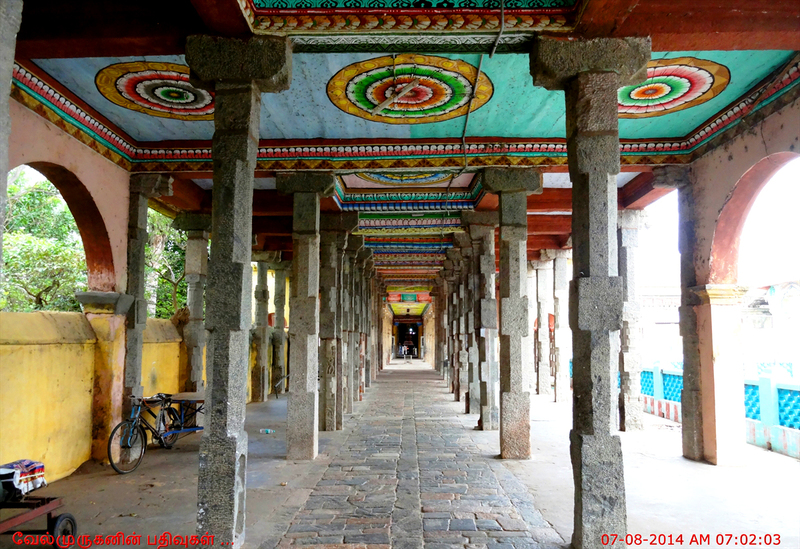 Sivamurugan asserts, “You visit a temple by invitation only.” I was destined to revisit. Asked his views on “vibrations” while attending temples, Sivamurugan mentions that satellites have detected vibrations at the Saturn temple. Why the Saturn temple alone? Is it the most “powerful”? “Depends on your horoscope.” On probing if cosmic radiation impacts two contiguous people in a temple similarly, I elicit the same response: “Depends on your horoscope.” Planets stand like karmic embodiments and impediments in your horoscope in constant combat. Forces governing our destiny resolve themselves quite scientifically like vectors into a net effect. You cannot derail destiny but visiting temples alleviates effects – you will fall if destined to but will escape with a scratch rather than a fracture and mentally accept destiny, I have found, more readily. People usually go to navagraha temples for material needs. The mental peace is richer reward. I am “destined” to revisit the navagraha temples, Sivamurugan said. Possibly because, in June, I entered the Mars and Venus temples but strangely did not spot their shrines. Or remark on their recesses and splendid architectural facets. The Vaitheeswaran (Mars) Temple, aglitter with a billion lamps is gorgeous. Imagine, seven years ago, I dismissed the navagraha temples as aesthetically unexciting – without entering them. The Rahu temple is an enchantment, Mercury boasts an impressive stock of nagas (snakes) encrusted in the bowers of an ancient tree. Saturn is perhaps stylistically indifferent. It is the Jupiter temple I deem the most aesthetically accomplished and indeed spiritually elevating of the lot. It is perhaps no coincidence that Jupiter is my lagna (ascendant) and, in June, I intended embarking for Tanjavur omitting this temple but was compelled to visit, on a Thursday, too (special for Guru), by the contrivance of nothing less than a blistering thunderstorm. Destined to visit? Then, I jumped the queue, with extravagant excuses, to reach the deity. This time, I prepare for a three-hour queue on a Thursday. There is a blaze of gold adorning bedecked devotees. The lesson that Guru (Jupiter) the “Teacher” imparts to me is that my mind is so busy observing the chaos without that I fail to see the chaos within. Temples should bring introspection and correction. There remains the Moon temple – minuscule, sober. En route back on Krishna’s recommendation, I stop at the Panchavarneeshwarar Temple with antediluvian svayambhu lingam that apparently changes colour five times a day. The temple seems beautiful but is gulped in darkness. 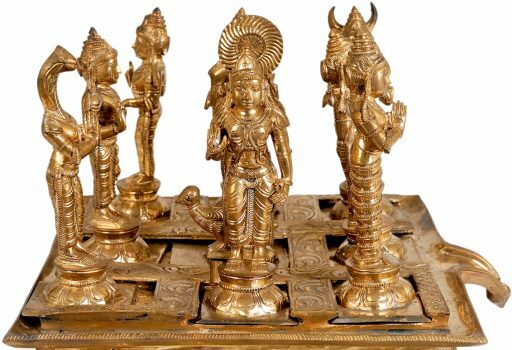 Contrary to popular belief, nadi astrology and navagraha temples are not concomitants. 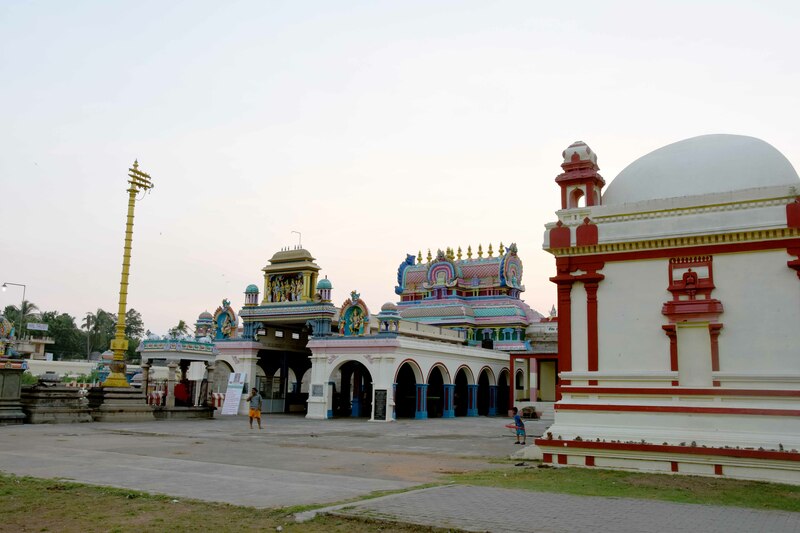 I myself was sent to the Sarabeswarar temple – not part of the navagraha repertoire. Lata, owner of Paradise Resorts where I’m staying, and where nadi and navaraha tourists head, is startled that Sivamurugan even instructs against prostrating before planets, which are but intercessors like Catholic saints that petition on your behalf. “Who is the principal deity at navagraha temples?” he asks rhetorically. Siva, obviously. “Then supplicate before Siva alone.” I say I prefer the “vibrations” in the Adikumbeswarar Siva temple to the Sarabeswarar temple that my nadi leaf prescribes for me. “The pill is bitter,” he says cryptically. It is vibrations in a particular prescribed temple that rectify past lives’ karmic consequences. The Panchavarneeshwarar Temple’s priest says that karma takes lifetimes to coagulate into pythonous binding chains. Sivamurugan and Krishna deploy the same expression to connote that karmic knots cannot be undone in one temple visit and the eventual mental sophistication temples effect. As for the colour-changing lingam, the Panchavarneeshwarar Temple’s priest says the fifth colour is the one we would like projected, which we must meditate on. After the meditation, the lingam looks no pinker to me. Back at Paradise Resort, though, I look up from my idiappam to see a Ukranian tourist sporting pink hair. God works in mysterious ways, indeed.